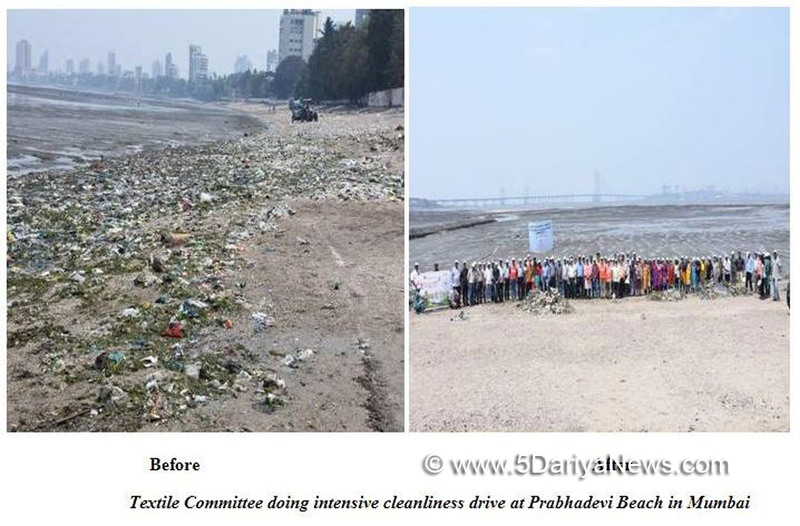 The Textile Committee in Mumbai organised a cleanliness drive at Prabhadevi beach in Mumbai and removed ten tonnes of garbage and local residents also participated in this drive in a big way during the recently concluded special Swachhta fortnight from 1st to 15th March 2018.Several other activities were also conducted in the Ministry and its attached and subordinate offices across the country. Senior officers of the Ministry visited various offices and 9 Public Sector Undertakings located in different parts of the country to motivate the staff for cleanliness. Swachhta pledge was administered to all officers and staff in the Ministry and short films on Swachh Bharat were shown to all employees.Special workshops were conducted on the campuses of National Institute of Fashion Technology Bhopal and New Delhi to sensitize the students and staff regarding recycling and how to convert old and discarded cloth material and other unserviceable items into useful carry bags and hand bags. The NIFT students used to waste to generate wealth and create aesthetic products. The Ministry is also working on replacing plastic bags with reusable jute bags designed by National Institute of Ahmedabad which are being used at SAFAL and Mother Dairy outlets.Special debate, essay competitions, lecture by doctor about hygiene and tree plantation drives were organized by the Textiles Ministry during the fortnight.Addressing the Press Conference Minister of State for Textiles, Ajay Tamta said that apart from this special fortnight the Ministry has been continuously engaged with Swachhta activities throughout the year. The Minister further added that cleanliness can become a reality only if every person decides to neither litter nor let others litter. He said Swachhta is everyone’s responsibility and it should not be left to sanitation workers alone.